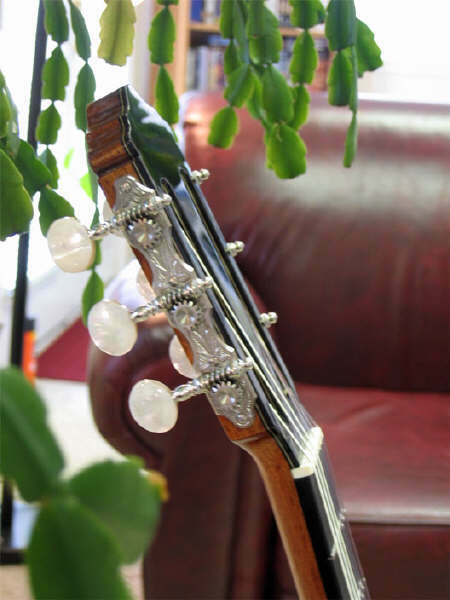 C uban cedar, Cedrela Odorata , is Breslin's preference for the neck and heel. 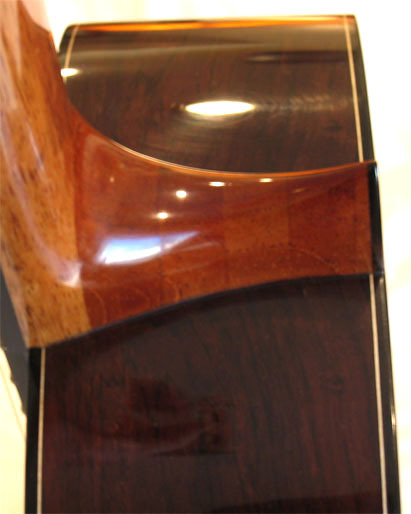 This wood is known for its moderate weight and excellent strength. It also carves very easily. Larry built a large stock while living in Florida. 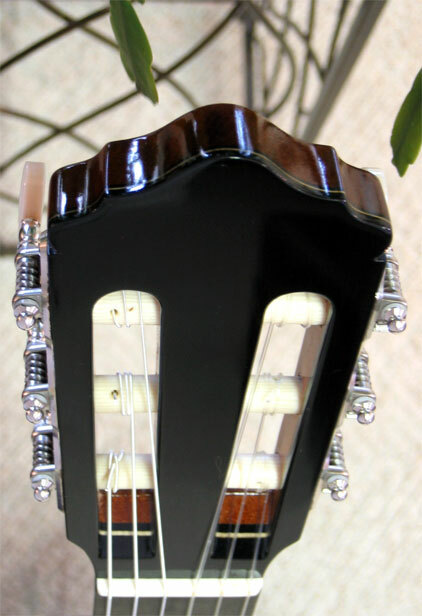 His overall neck design is influenced by Ignacio Fleta, who avoided the use of neck reinforcements. 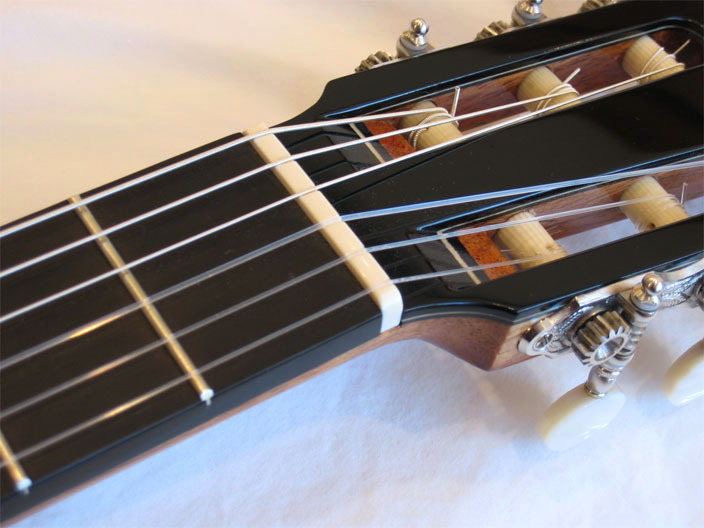 A traditional 15-degree scarf join is used to attach the headstock to the neck. 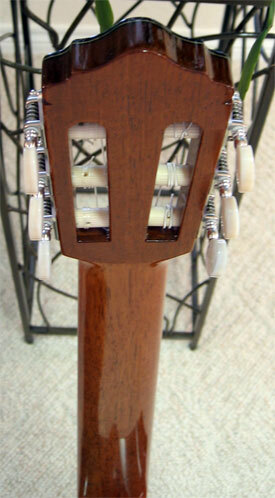 T he headstock is also made of Cuban cedar. The wood has a nice copper hue. 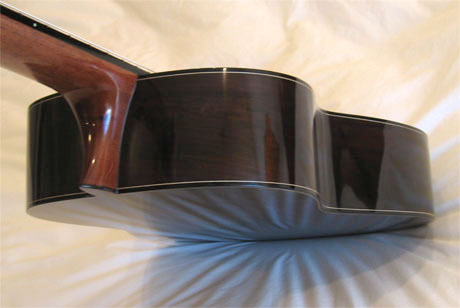 A n ebony veneer covers the head, with a white/black laminate placed in between. 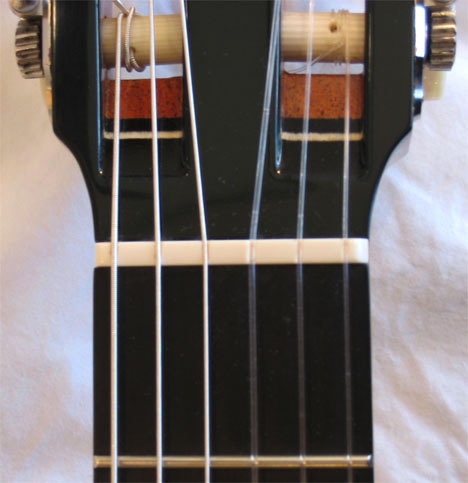 T his ebony fingerboard will eventually join the neck. 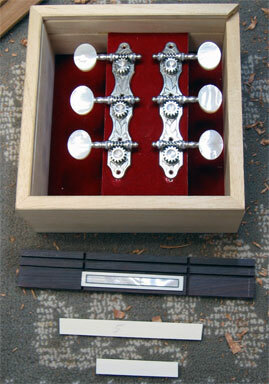 A small mother-of-pearl side marker will be placed at the 7th position. 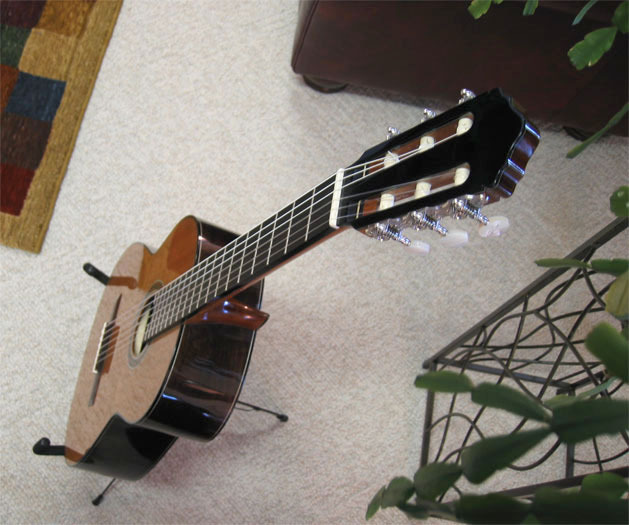 Many transcriptions, Chopin's Mazurkas for example, require a 20th fret, so Breslin will include this very high position. 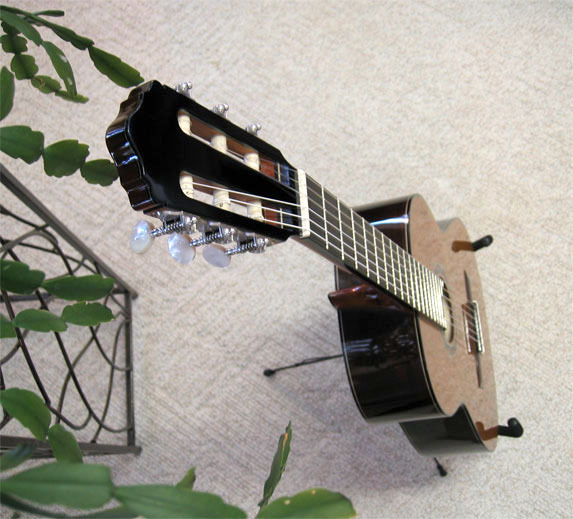 The strings will span a standard 650mm scale. 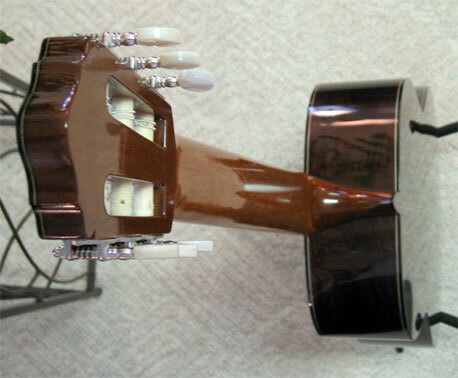 T he tuners are made by Nicolo Alessi. 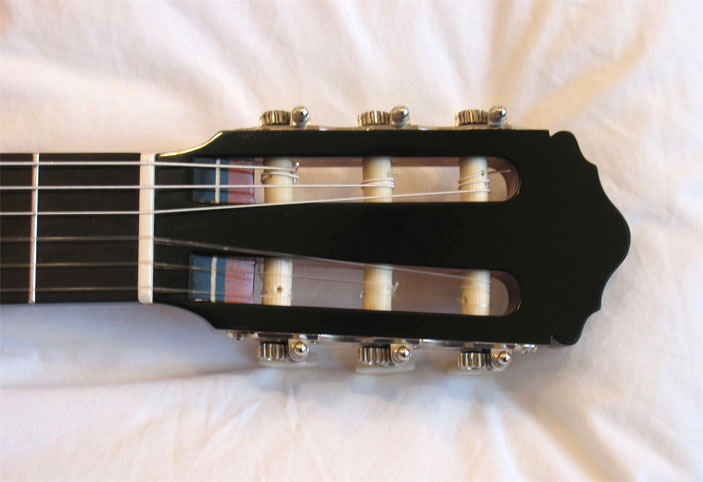 These are his Hauser Model VI plates. They are very heavy, made of bronze and plated in white gold. 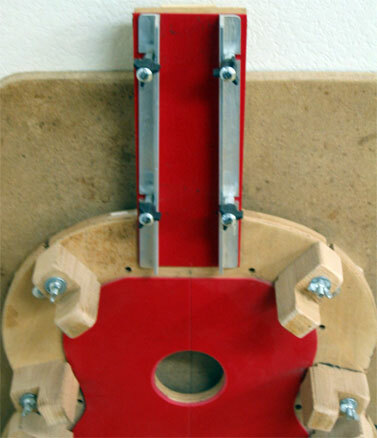 His gears operate smoothly and tension is adjustable. The rollers are spring loaded. 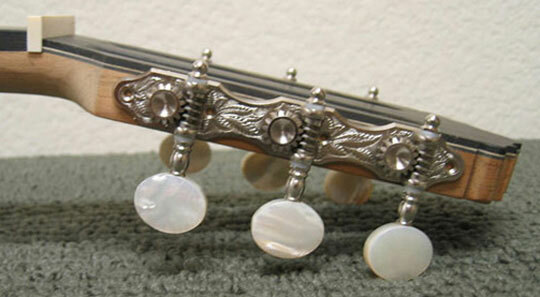 The classic leaf engraving and mother-of-pearl knobs are beautiful. 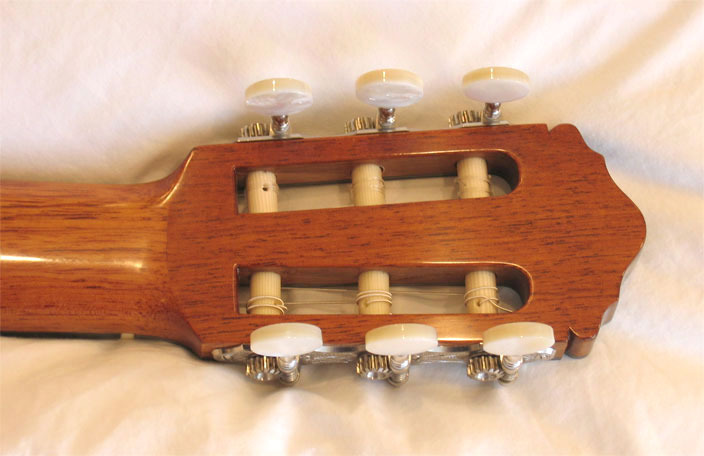 These gears cost more than Sloane or Gotoh machines, but are less expensive than similar Rodgers hardware. 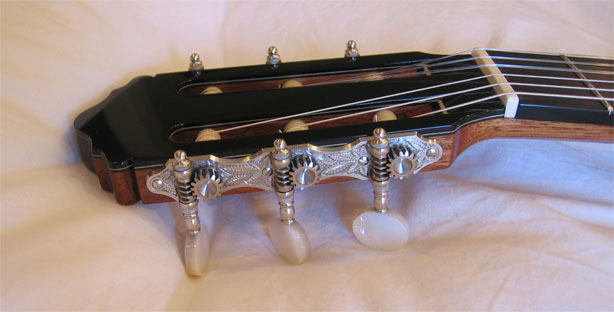 The mother-of-pearl knobs, white gold plates and white rollers offer dramatic contrast to the dark ebony veneer. 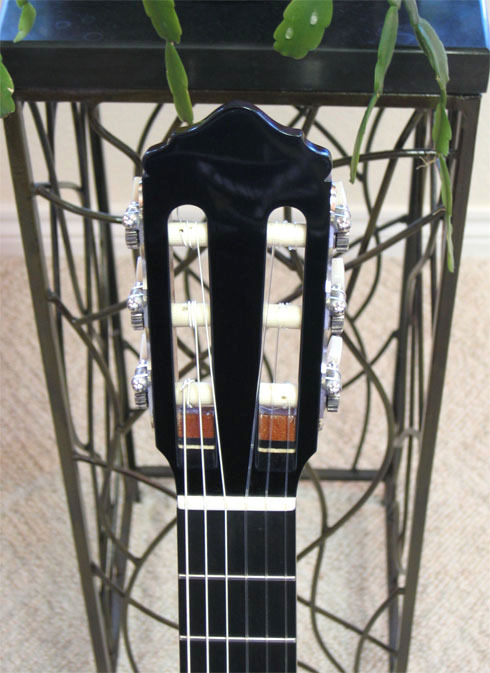 This conforms to the overall design, balancing similar contrasts in the rosette and bridge. T he rollers use a nifty spring-loaded mechanism; the smaller pin hole is where the spring is braced. T he leaf motif is engraved with considerable detail, including cross-hatched shadows. 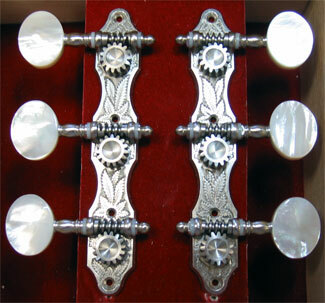 The mother-of-pearl knobs are simply wonderful, even a bit over-dramatic. What can I say, other than I just couldn't resist the temptation? S et-up components are gathered here; they also play a key role in the visual theme by providng brilliance to the headstock and saddle. P re-ban ivory blanks will be used for the saddle and nut. A 51mm nut will be shaped. One end of the bridge will have a slight under hang that allows it to be lifted/removed easily. 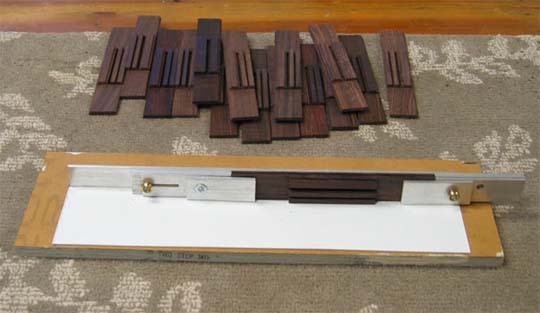 E ast Indian rosewood bridge blanks are exclusively used in Larry's workshop. 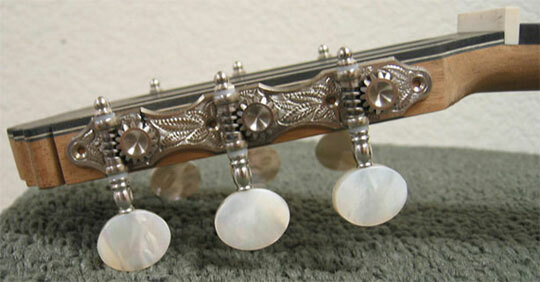 The bridge will be inlayed with mother-of-pearl for additional contrast. 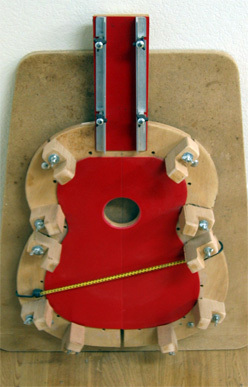 T his jig is used to join the neck with the body. I t is designed to brace and flexibly adjust for various degrees of neck rake angle. 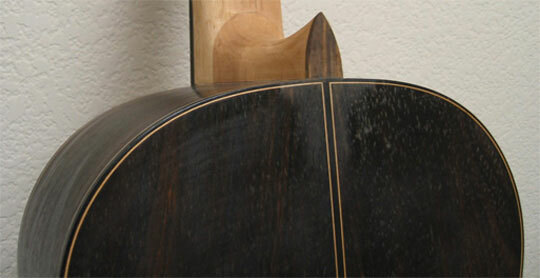 T he guitar has been removed from the neck jig; the join is complete. A mortise and tenon is used with epoxy for the join. 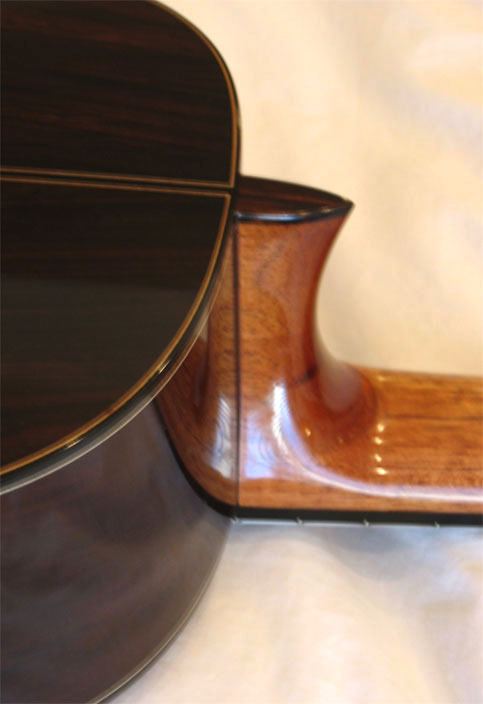 A rosewood heel cap finishes the job. T he bridge is placed in a special jig for precise drilling/shaping work. 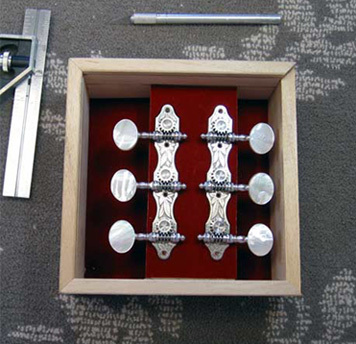 H oles in the jig serve as the template for various drilling tasks, including Larry's special pin bridge design. The bridge is very securely braced by the jig, yet it allows for easy access. T he head is carved to its final form. The design is strong yet elegant. 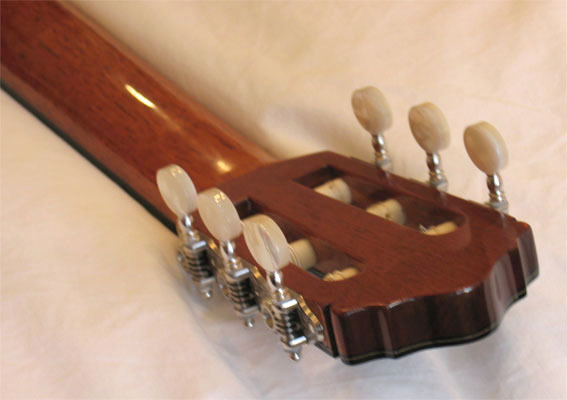 T he fingerboard is joined to the neck and fretted. Larry shaped a 51mm nut for me. The surrounding area was also carved just a little thinner than average. 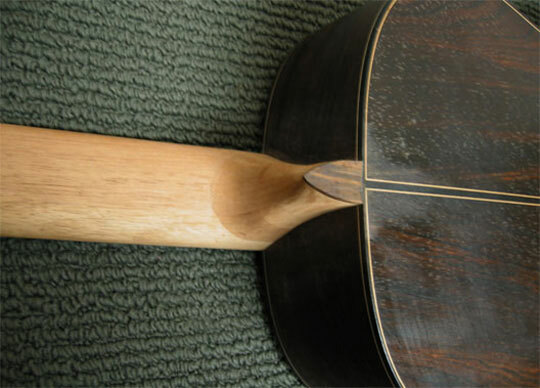 The fingerboard is not flat; it has a very slight lateral bevel that helps bar work. 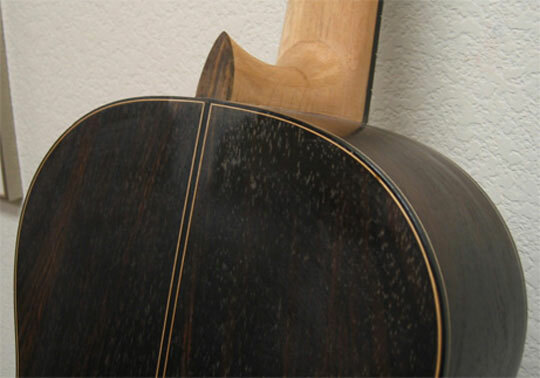 B reslin's very comfortable thin-line neck in profile. This fabulous shape is consistently maintained all the way up to the heel. A small 7th position side marker is now in place. 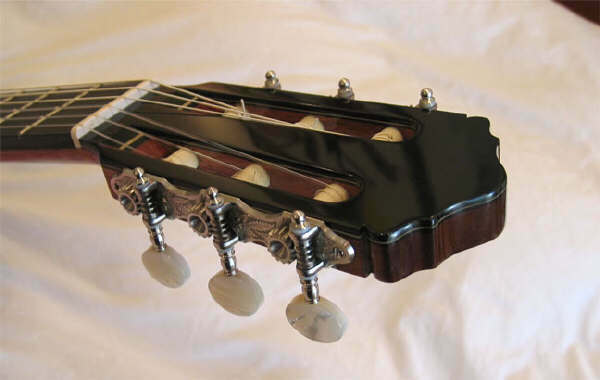 I really like Larry's new headstock design; it avoids garish over-statement. 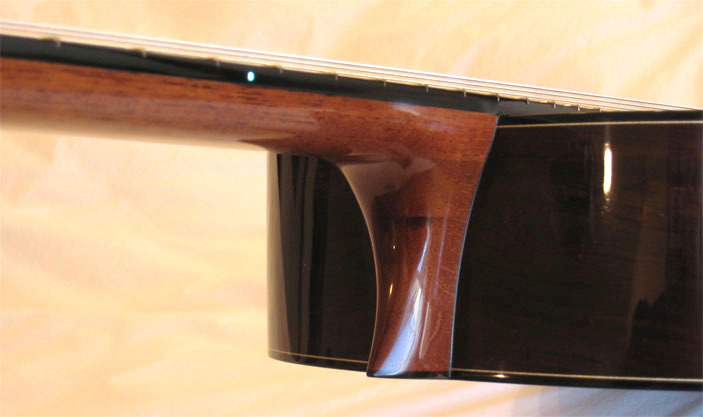 T he crown's curved shape contrasts the overall strong rectangular headstock. 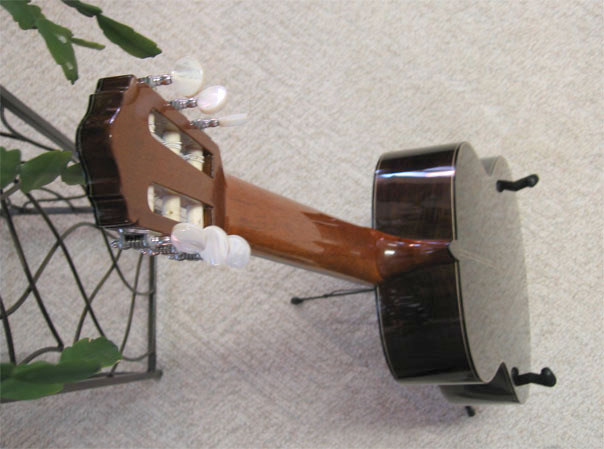 T he Alessi tuning machines are test fitted on both sides. M y guitar is finished! In all, five months have transpired. 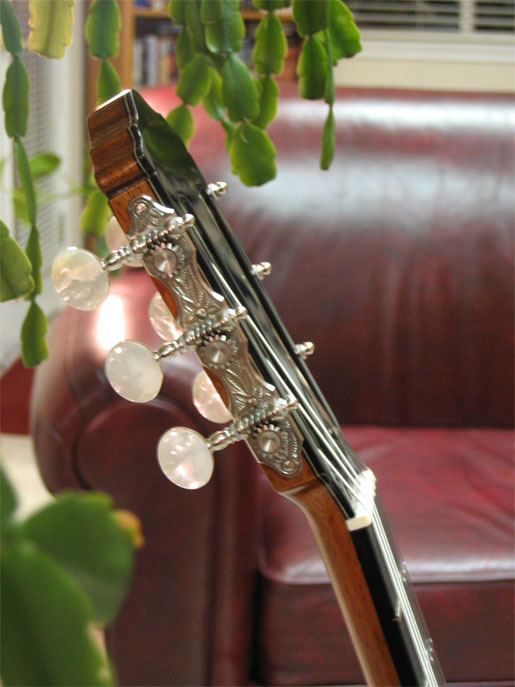 The following photographs focus on the instrument's neck, headstock and bridge, documenting Breslin's excellence.